Just a little note to say my thoughts and prayers are with those in Ottawa that experienced the terror yesterday and to the family of the reservist who was killed. I have been inspired by our nation's response, the leaders, media, and citizens. We are a proud nation and that is evident. The support we have received from around the world has been humbling as well. One thing to keep in mind is that even though there are bad people in the world, they are always outnumbered by the good people. Now onto the scheduled blog post that turns out to be somewhat fitting today, when any sort of comfort is welcome. As you know, I am a fan of Jamie Oliver. 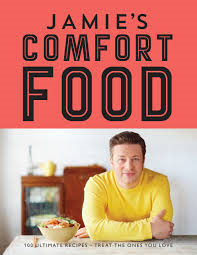 He has just released a new cookbook, that is now on my Christmas list, called Comfort Food. In this book, Jamie makes the classic comfort foods but uses all of the best ingredients and methods to bring you a heightened version. He said in his interview with Jian on Q that when he was asking people for their favourite comfort foods to put in this book, he said they all were accompanied with a story of when they ate it, who made it for them, how they felt when they ate it. That's really it, it's food, but the comfort comes more from the warm memories that go along with it. I thought I would share some of my comfort foods and the stories that go along with them. Growing up, and being in the Atlantic time zone, my mom and I would go to the local Remembrance Day ceremonies (usually with me being in the parade as a girl guide), and then we would go home in time to catch the televised ceremony in Ottawa, of course starting an hour after ours. Mom would make us grilled cheese sandwiches and tomato soup, and since it was usually grey and cold on those days, the warm food was especially welcome. Of course we ate this meal on other occasions, but to this day, but it always reminds me of November 11. One of the best things about Tim Horton's is that you always know what you're going to get, it is consistent. I went to Cuba one year when I was in university and on the last day we may or may not have had a few too many beers and espressos, compounded by our flight being repeatedly delayed. I was so dehydrated when we got on the plane, I just felt awful. When we landed and my friend's mom picked us up, she asked what we wanted and we said "Tim Horton's". Never had any food been so welcome and so comforting. Now, when I'm not feeling well, a bagel and tea can usually make me feel better. I love a good ham dinner. I don't actually have a specific story about this meal, other than it was a standard meal at my house, my grandparents' house, and at many church suppers. It used to be the meal I would request for my birthday. This is a restaurant in my hometown. When I was growing up, we would often, but not always, get pizza on Friday nights from Scotia Lunch - pepperoni, mushrooms, and green pepper on half. The crust is thick and crispy, and the cheese is thick and bubbly, and not like what we order here, or anywhere else. When I go back for a visit, we try to have this at least once, and it is exactly the same as it's always been. But really just cherry pie that my Nana made (no offence Mom!). She knew it was my favourite and she would make it for me (from scratch mind you) when I would visit her. It was always so yummy, and she would add almond extract, which made it better. The story would always be told about their friend who, if there were any cherry pits left in the pie, would always get it, so we were reminded to watch for the pits.